I‘m not one for visiting nutrition stores, the closest I usually get is nipping into Holland & Barrett every now and again to stock up on herbal teas and almond butters! The reason being that I still, probably quite wrongly, see nutrition stores as being aimed at men that are trying to bulk up and have arms bigger than my head. Predator Nutrition is unlike any nutrition store I have ever been to. First of all it is conveniently located in the heart of Leeds within The Light shopping mall, a place I know and love from my time living in Leeds. 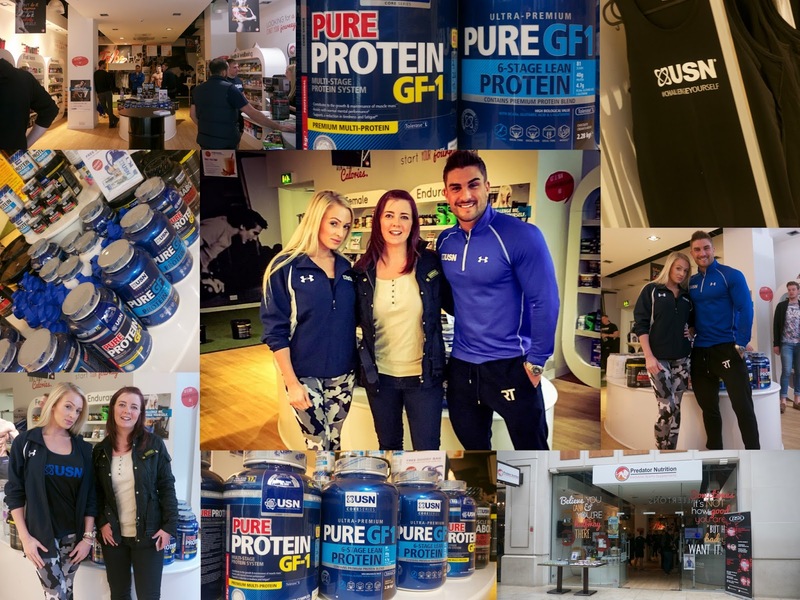 The brains behind Predator Nutrition wanted the store to be different and fill the gap in the market for a nutrition store that made you want to visit; its bright, airy and well organised inside and the staff are friendly and knowledgeable. The store itself revolves more around health & wellbeing than bulking and shredding, with shelves and shelves of tasty treats, supplements and of course protein. USN is one of the world’s biggest and most well-known nutrition brands, they have made training supplements more mainstream and accessible thanks to their partnerships with some of the industry’s leading figures. As part of the launch for two of USN’s newest products (I’ll be letting you all know about the B4-Bomb soon) I was able to meet Ryan Terry & Heather Schofield and the hot topic of the day was staying motivated. As the days get shorter and the remaining days of the year dwindle away, often so does our motivation to stay fit and healthy. But never fear, it turns out that motivation is something that even the pro’s struggle with especially now that competition season is over. So how do they deal with it? They set goals; these don’t have to weight based or aesthetic based, they can be achievement based. This doesn’t even need to be as big as to run further or to lift heavier, it can be as simple as training twice a week if you don’t train regularly. They mix it up; don’t get stuck it in a rut or begin to feel like training is a chore. If there’s a particular sport you love, try and incorporate it into your schedule or if there is something new that you want to try out do it, keep it interesting and keep at it. They prepare; go shopping once a week, write a list and stick to it. Then prepare your meals in advance to prevent binging and going off track when the going gets tough. They also plan their training in around their schedules, aim to fit it in a cardio session and a weight based training five or six days a week if you’re looking to get lean. But remember abs are made in the kitchen and not just in the gym. They go for it; everyone has a battle with their confidence at some stage in their life and these guys are no different. You may think they have nerves of steel getting up on stage and flexing for all to see but that is probably more down to the adrenaline running through their veins as they step out in front of the crowds. Ryan started working out because he had a complex after a couple of injuries made him more sedentary than he was used to being. Don’t be afraid of going after what you want, just go for it. So let’s make a pact this Autumn/ Winter, let’s get off our backsides and go for it, whatever our goals may be. I had a great time with the guys from USN & Predator Nutrition and got so much out of the day.